In the apartment "Patrizias Sweet Home" (100 square meters) families or groups of friends, from 2 to 7 people can be accommodated.The apartment is well equipped (satellite TV, heating, shower, bath, washing machine, towels, bed linen, kitchen appliances , Hairdryer, iron, ...) and consists of two double bedrooms, a spacious living room with fireplace, a kitchen and a bathroom. The apartment is also equipped with a beautiful terrace with sea views, a dining table, four chairs and two deck chairs.The apartment is located in Terme Vigliatore (Messina) on the northeastern coast of Sicily, in the beautiful bay between Milazzo and Tindari with a wonderful view to the Aeolian Islands in the north and the Nebrodi Mountains and the volcano Etna in the north. 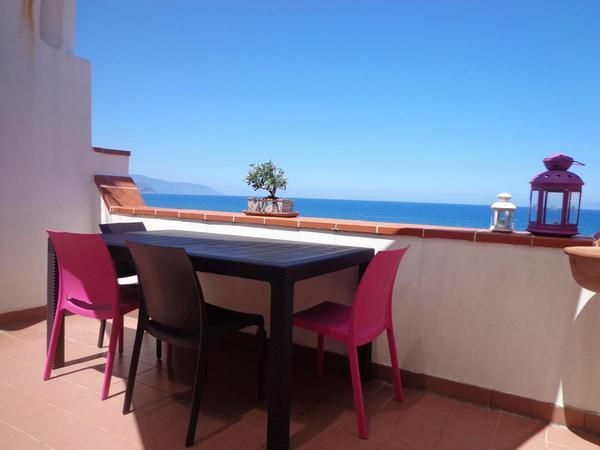 The apartment has a strategic location: the Aeolian Islands are reachable with daily connections from Milazzo (a hydrofoil or ship every hour) or Marina Portorosa in Tonnarella locations in the municipality of Furnari. The location of the apartment makes it the ideal starting point for many tourist routes in the province of Messina, as well as in many places of Sicily's archaeological and touristic. • the center of Milazzo, characterized by a unique natural beauty of the promontory of Capo Milazzo, the castle and the old village. • the villages of Castroreale, the medieval fortress and Montalbano Helicon, located on a promontory at 900 meters above sea level. Finally, with daily excursions you can reach Palermo, Catania, Mount Etna, Taormina, Cefalu and much more. You will choose a relaxing holiday by the sea, with sun and enchanting nature, or get to know the culture, traditions, history and archeology that have made Sicily one of the most fascinating countries. We await you and wish you a pleasant stay. Gas: according to consumption (Mandatory). Final cleaning: once per object Costs amounting to 60 EUR (Mandatory). Cot for adults: once per person for rent at a price of 10 EUR (optional). Bed linen: once per person for rent at a price of 10 EUR (optional). Cot for children: once per person for rent at a price of 10 EUR (optional). Towels: once per person for rent at a price of 10 EUR (optional). Fuel for chimney/fireplace: per object and day according to consumption (Mandatory). Internet: per object and week included in price (Mandatory). Pet: per pet and week Costs amounting to 30 EUR (Mandatory). Terme Vigliatore is a town with an important historical, cultural, landscaping and environmental heritage and of prestigious value: heritage that deserves to be safeguarded and protected, valorised and advertised. From the presence of sulphurous waters, on the homonymous hill, the place was formerly called "Termini", which then became Terme in Roman times. There are two sources: the "Source of Venus" which, for the efficacy of its sulfur waters, exerts a strong recall from May to November, and the "Fonte Ciappazzi" which produces mineral water appreciated and known throughout the Mezzogiorno. Its special geographic location, the fertility of its lands, the presence of ancient Roman vestiges and thermal springs, buildings of great artistic and architectural and ethno-anthropological interest and the beauty of the sea and hilly landscape make Terme Vigliatore a worthy place of note. Among the motives of recalling Terme Vigliatore is certainly the famous Villa Romana, dating back to the era of Sicily of the High Empire (1st - 2nd century AD). Activities: At Terme Vigliatore you can alternate with the sea-resort with thermal treatments, walks along the hilly path, visit the archaeological excavations of S.Biagio, the open-air evening shows on the promenade of Marchesana, hiking in the nearby Gulf and inland areas, while enjoying the pleasure of living in touch with the folk traditions of popular flavor. The privileged location of Terme Vigliatore, on the main routes of communication in Sicily, offers the opportunity to go hiking and excursions to the major Historical Tourist and Cultural Centers of the Province of Messina such as Milazzo, the Aeolian Islands, Tindari, as well as for excursions to the ancient cities Greeks of great archaeological interest such as Abacenum (Tripi), Longàne (Rodici Milici), Noa (Novara di Sicilia), and also cities of great artistic and monumental interest such as Castroreale, Montalbano Elicona, S.Lucia del Mela, Roccavaldina. Events: Feast of patron Madonna delle Grazie 15 September, traditional "Fair of Termini. Linen (once per person, available 5 EUR). Towels (one per person, available 5 EUR). Cot (once per object, costs in the amount of 10 EUR).